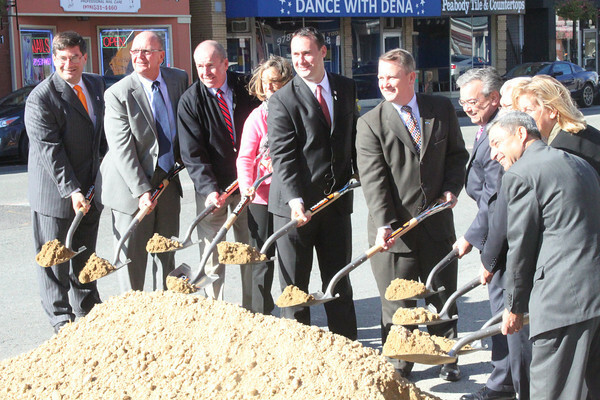 Several city and state officials had the honors of ceremoniously breaking ground on the Peabody Main Street Corridor Realignment project Oct. 16. From left are Peabody School Committee member Jarrod Hochman, City Councilor Barry Osborne, City Councilor Tom Gould, Peabody Chamber of Commerce Executive Director Deanne Healey, Mayor Ted Bettencourt, Lt. Gov. Tim Murray, City Councilor Dave Gravel, former Mayor Mike Bonfanti, state Senate candidate Joan Lovely and state Rep. Ted Speliotis.